In Part 1 I discussed how the hind leg works via the ‘stay system’, as well began to discuss angulation within the leg. In Part 2 I’m going to talk about ‘gearing’, and hock and stifle placement. 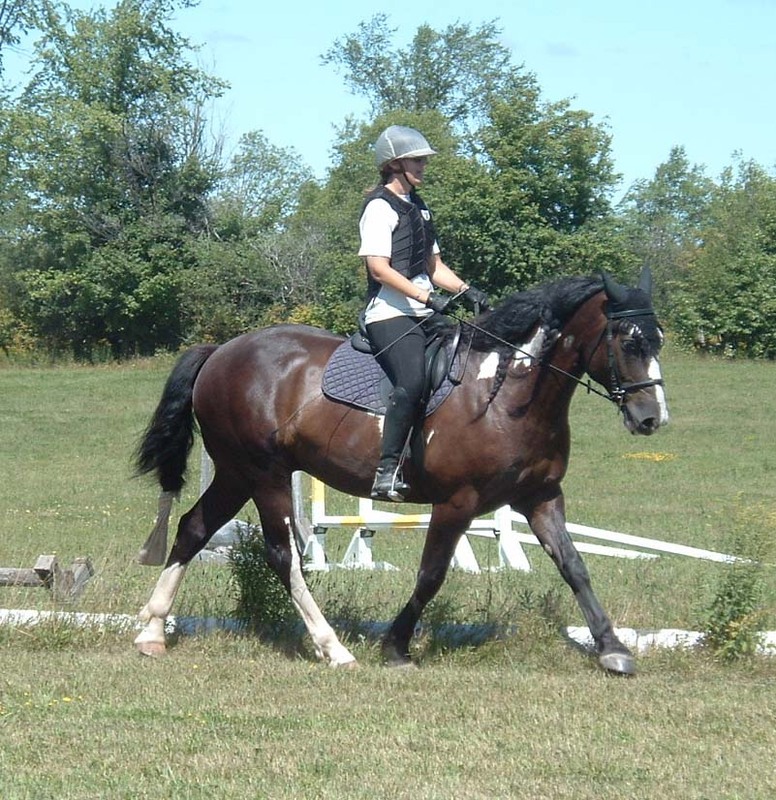 Gearing – A horse has but one gear, so it’s important to pick the right horse for the task. 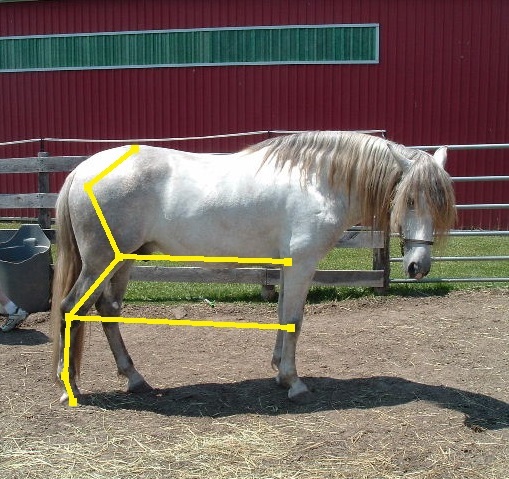 How a horse is geared is determined by the proportions of the bones in the hind limb, their ratio to each other individual and as a whole. 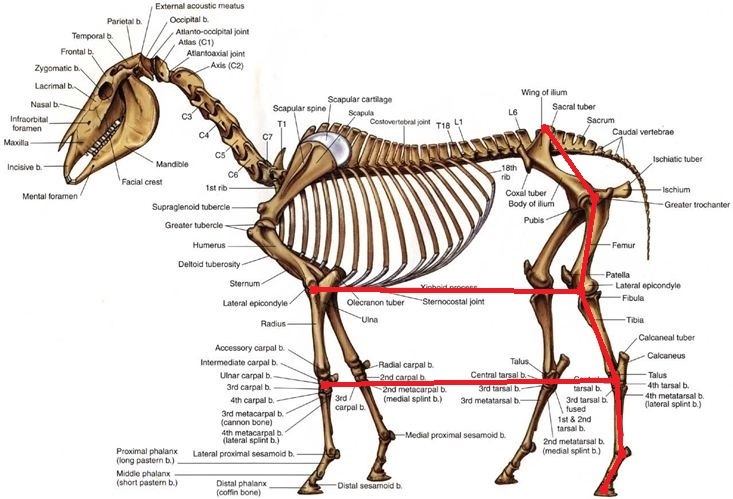 Those bones are the iliac part of the pelvis, femur, tibia (gaskin), cannon bone, pastern and hoof. Adding those bone lengths together will give you Total Hind Limb length (THL). THL is then compared to the horse’s height at the croup. 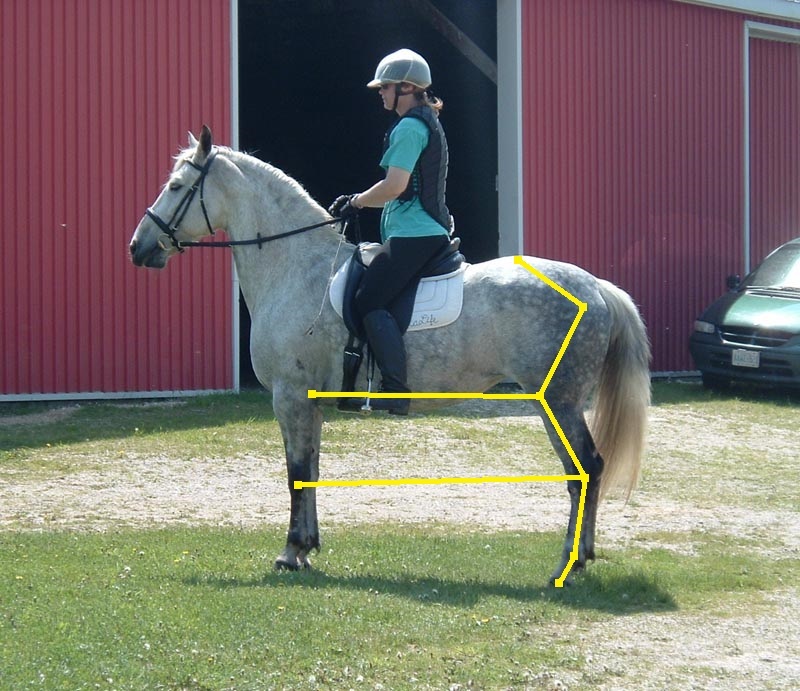 Adjustments in the croup height have to be made if the horse is croup high or croup low (such as standing parked out). Even though it’s important to understand THL, I’m going to avoid going too in depth. To do so would put dozens and dozens of numbers in front of your face, and after a while you’d want to shove those numbers right up my you-know-what. I’ll pick a few strategic places to talk about it to give you an idea. The hind leg acts much like a chain pendulum. If the upper link of such is short, it will swing rapidly back and forth in a relatively short arc – think cuckoo clock. Any links attached below, even long ones, will also swing rapidly in a relatively short arc. If the upper link is long, then the pendulum will swing slowly in a long arc – think Grandfather clock. Any links attached below, even short ones, will also swing in a long, slow arc. The bone with the biggest determining factor in this chain pendulum type of gearing in the hind leg is the femur. 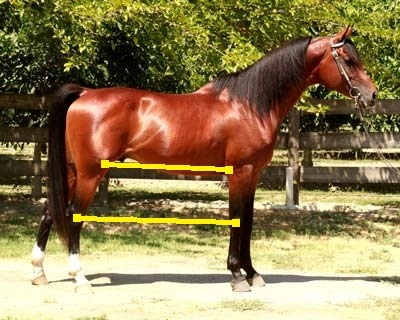 Therefore a short femur will give short, quick strides as you’d want in a racehorse or a draft (first gear), and a long femur will give longer, slower strides as you’d want in all other equine disciplines (third gear). A short versus long femur is determined by looking at THL, but also by comparing it directly to the tibia. A horse geared in first will have a femur that is clearly shorter than the tibia, while a horse geared in third will have a femur that is at least as long as the tibia or longer. A disadvantage of a long tibia is that it tends to create the conformation faults bow-legged or cow hocked. It will also cause destabilization in the hind leg and when moving these horses tend to twist their hocks. Strengthening the abductors and adductors through lateral work can help reduce the twisting. Hock And Stifle Set – The simplest way to say this: the higher the hock and stifle (that is away from the ground) the more the horse must work and engage to shift weight rearward and lower the haunch. 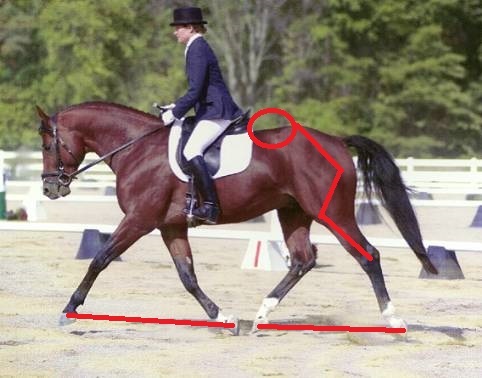 The hock can never be lower than the knee, but the closer to knee height the better for your riding horse. High hocks via a long cannon bone tend to cause the hocks to pogo up and down rather than to come forward and under the horse. 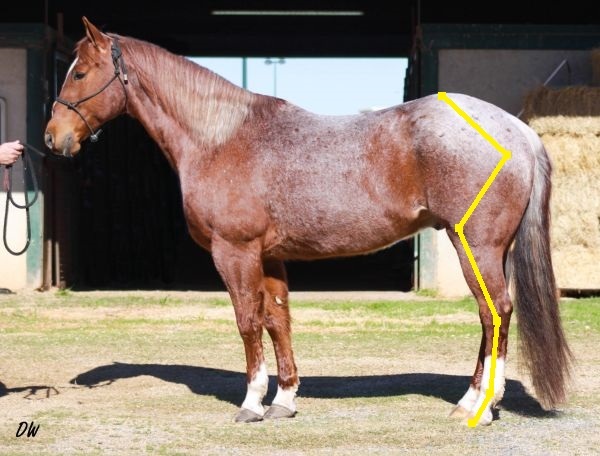 If you were to combine that with a short femur, that signifies the short, quick stroke of first gear, you can readily imagine how much harder it just got for the horse to bring those hocks forward and underneath the body. 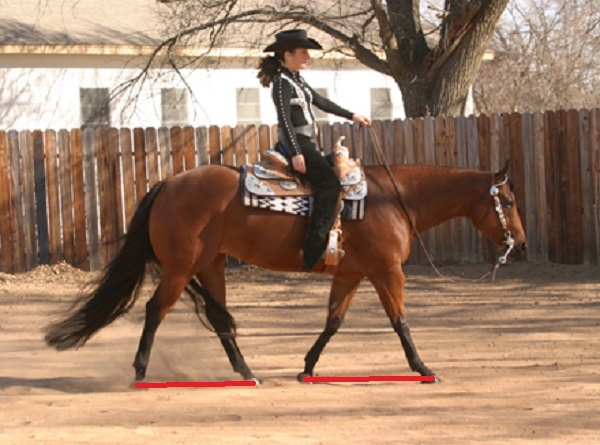 The stifle can be lower than the elbow, though rare; we do want to see the stifle at least close to elbow height for riding horses. Our skeleton horse has a low hock set with the hock ever so slightly higher than the knee, and a low stifle set with the stifle lower than the elbow. It is, however, a post-legged skeleton. Post-legged means that the angles created at the joints (particularly the stifle and hock) are too open. Post-legged also means the leg is too short. Longer bones would create a more ‘Z’ shape, therefore more angulation. Let’s look at our sample horses more closely. This horse has a desired low hock. The stifle is set high. While the tibia is long when considering THL (it’s the highest ratio bone), it’s just as much that he’s generally short-legged in front that puts that stifle where it is. He has a tibia that is clearly longer than the femur, which is what we’d expect from his sprinter-type build. The femur is short (indeed the same length as the cannon bone) representing only about 21% of THL, so this is a first gear horse. In fact, he’s a little short overall in the THL department and thus is a bit post-legged. Still, here’s an individual who is going to be powerful and quick. This horse also has a low set hock, but with a lower stifle than the first. This horse’s tibia is also clearly longer than his femur, while the femur represents a slightly higher ratio (22.5%) of THL than in our first horse; this guy is still geared for first. 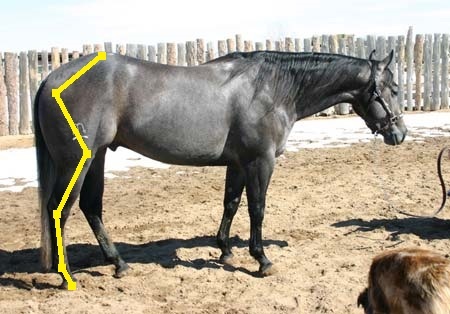 Compare the hock angles of the two horses. They are identical at 151 degrees. 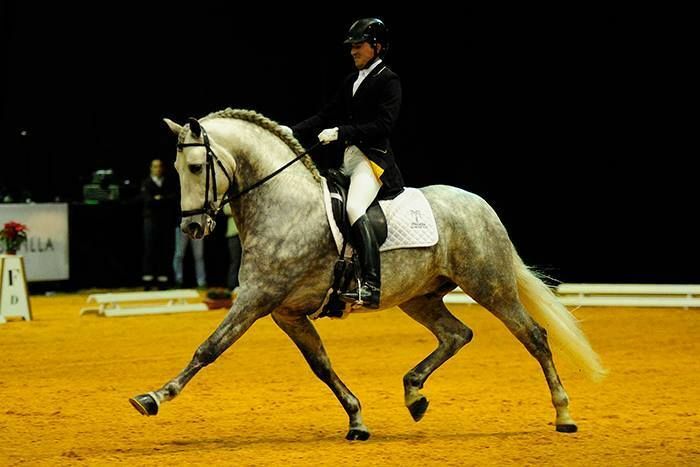 The stifle angles differ by a few degrees – 125 for the roan, 122 for the stallion. 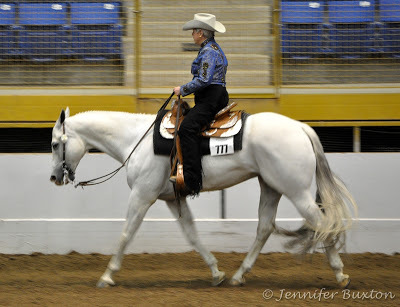 The thigh angles differ the most with the roan at 98 degrees and the stallion at 103 degrees. Summarized: the stallion is more open in his top most joint, the roan more open in the stifle, both are the same in the hock. Now note the difference in stance of the two horses. 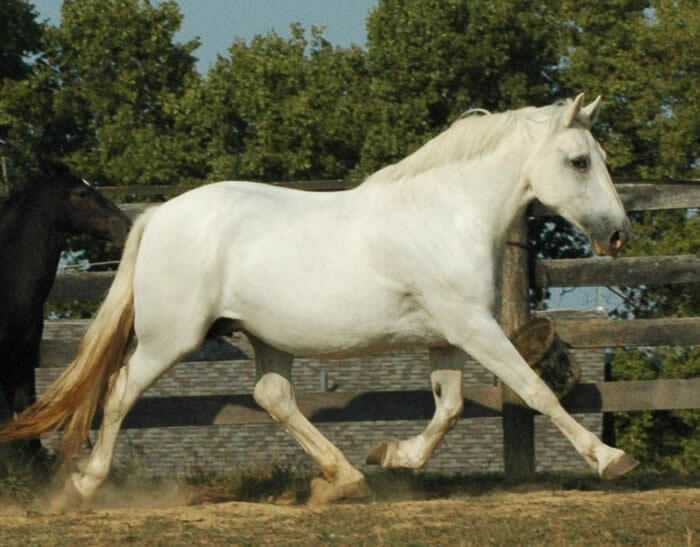 The roan horse is standing too far underneath himself, artificially closing the joints of his hind leg; see that his cannon bone is not perpendicular to the ground and that the cannon bone falls quite a distance in front of the plumb line, the latter often an indicator of post-leggedness. At this point you have to use a little imagination and move the roan’s hind leg back a bit so as to create a perpendicular cannon bone. That will open all the joints in his hind limb including that hock angle, per the rules of the hind leg stay system. (Refer to Hind Limb – Part 1 concerning stay system as well as maximum angle created at the hock during full extension.) By doing so, that will make the hock too open, and the horse too straight, and therefore post-legged. This at first might seem a contradiction when we also discover that this horse has a 3% higher percentage THL to croup height than our stallion. In other words, compared to his croup height, this horse’s hind leg is 3% longer than the stallion. And yet…this horse is more post legged than the stallion. One other thing that happens when we move that cannon bone perpendicular and open all the joints of the leg, the horse’s croup rises and the horse becomes croup high. That then affects his overall body levelness and increases the difficulty of engagement. Undoubtedly part of this horse’s stance problem behind is the horrid trim job on his feet. Not only are the angles way too low, the toes proportionately too long to the too short heels, but he’s also got to be walking on his soles. Imagine having those hind feet balanced properly. What will that do to the angles in his leg and the height of his croup? 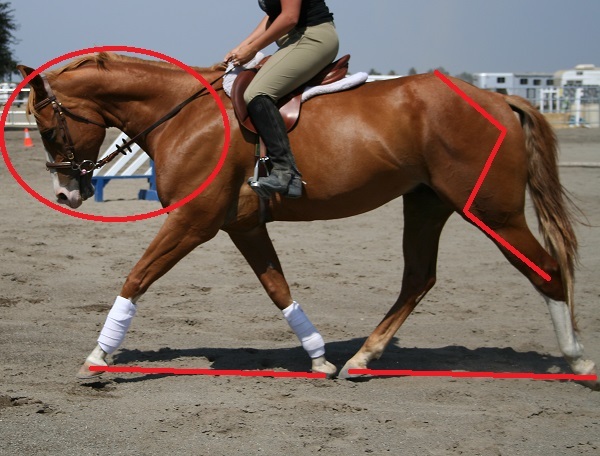 The same foot problem exists on the front and we see the horse standing over his shoulder with his front legs too far underneath himself. This horse stands over several less inches of ground than he should due to unbalanced feet, conformation and pain. In terms of athleticism, this horse too will be powerful and quick but not as much as our stallion, and there’s going to an additional problem. Right before landing and right after pushing off, he won’t be able to fully extend the upper portion of his leg because of the post-leggedness in the lower portion of the leg. He’ll be prone to hyper extending through the hock if pushed to engage. Indeed, his hocks show wear and tear. Thusly, as a means to protect himself he will take shorter strides. Here is a horse with a similar hind leg construction and as post-legged as the day is long. 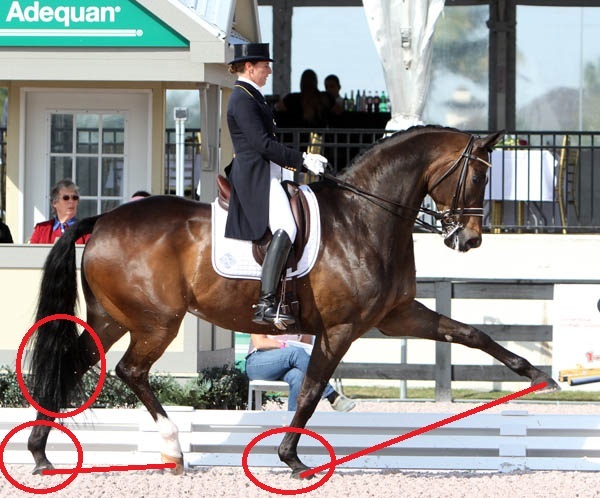 Look at how open the hock angle is on landed leg; 150 degrees and yet the horse hasn’t taken any kind of a deep step. In this second picture the hocks of both the leg leaving the ground and the leg landing are as open as is physically possible (160 degrees). This is as big a step as this horse can take, regardless of more joint range higher up. You can’t tell from the photo, but the horse is travelling on a bit of an upgrade and that’s what’s helped him take the step behind. 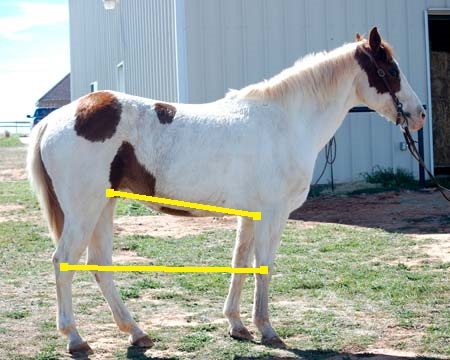 Moral of the story, avoid obvious post-legged horses regardless of pretty much every other strength the horse may possess because it’s next to impossible to engage them, and that is what’s needed to protect the horse’s long term health and soundness. This horse possesses the lowest placement of hocks to knees as a horse can get. Because he has low knees, thanks to those short cannon bones, he also has low set hocks. His stifle is set a bit higher than the roan gelding, but lower than the stallion. This QH has a proportionately longer femur than the previous two (25% of THL), as well the femur is at least as long as the tibia. 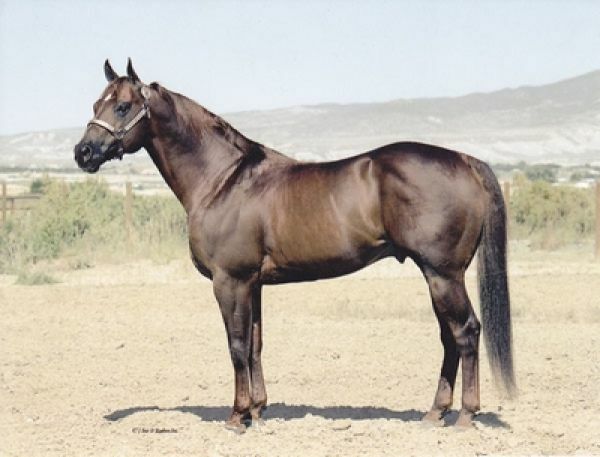 The horse also has more THL than the previous two horses, making him the longest legged of the three. (Indeed, he’s got the longest femur proportionately and the highest THL of all our sample horses.) There’s still plenty of power here, but this horse’s hind leg stroke is going to naturally be longer and slower than the first two. Western Pleasure anyone? Even though the horse is standing with the cannon bone not quite perpendicular to the ground (and a little in front of the plumb line, notice that the angles at the joints are more similar to each other (concordant), creating a more even ‘Z’ shape. I’m disappointed in this horse’s front end muscling. While he’s downhill, longer through the body, and doesn’t possess the highest set neck (all things that increase the difficulty of engagement), there’s really no excuse for the excessive lumpiness and over development. Someone has been peanut rolling this horse, allowing him to pull himself with his front end and trail his hocks. While the hocks are placed just ever so slightly above the knees on this horse, this is not a low hock set, but rather a high one. This is because the horse has high knees. Still, it’s a better high hock set to have than one via hocks significantly higher than knees. 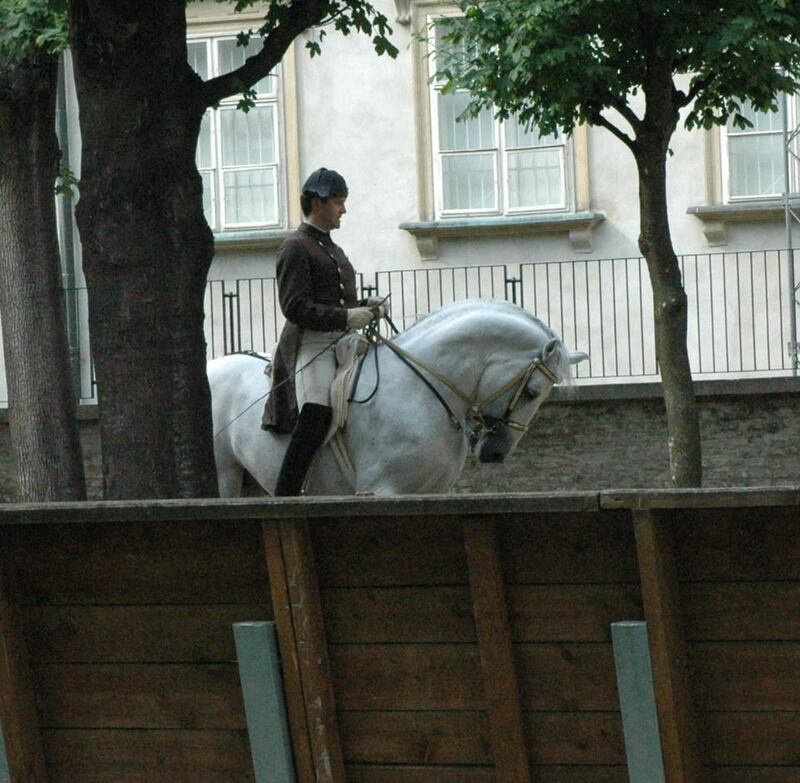 The elbow is also high on this horse (leggy horse – stands over a lot of air), the stifle just ever so slightly higher than the elbow, but still it’s considered a low stifle set. I’ve got nothing good to say. The tibia is clearly quite a bit longer than the femur, and the femur itself is short with approximately the same ratio to THL as the roan QH. Add to that stifle and hock angles that are wide open, a merely adequate pelvic length and a table top croup. Imagine a pogo stick that’s been broken in half and then duct taped together; that’s how I’d expect this horse to move behind. At least his head is pretty. 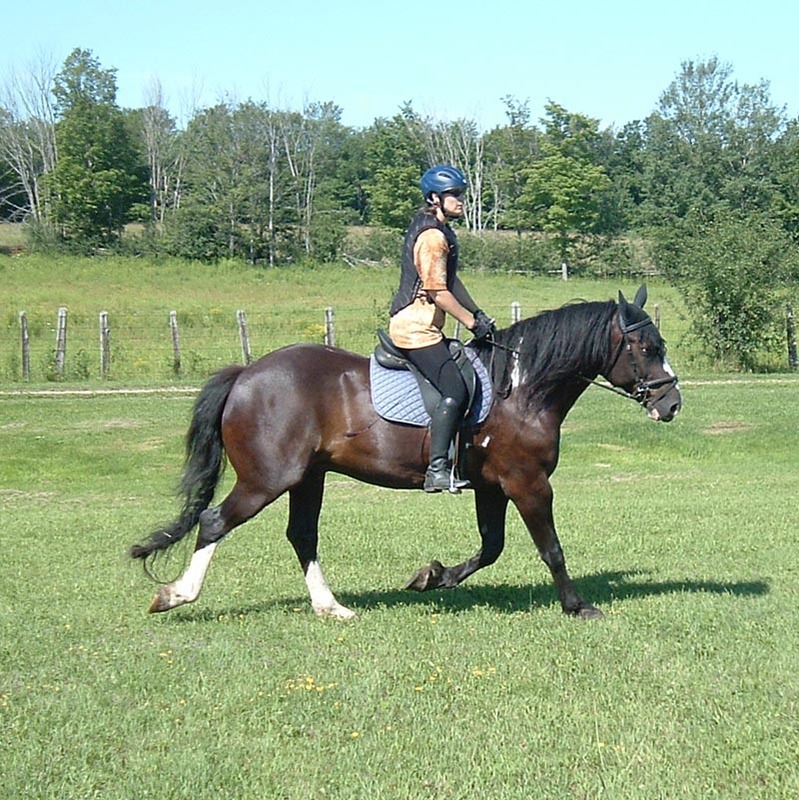 I drew the line from knee to opposite hind leg since this horse is standing with the near leg forward. This is a high hock set both because of its relationship to the knee and its relationship to the ground; another horse with a high knee. The stifle is also set a bit high, typical of the breed and what you’d expect from a distance runner. The tibia is longer than the femur and both hock and stifle angles are open. This is a typical hind leg of many TB racehorses, except a bigger hip would be wanted. This horse is not nearly as powerful or quick as the bigger-hipped, sprinter-type QH stallion, but still falls in the first gear category. This is another one where the high hock and long tibia can result in hock twisting. 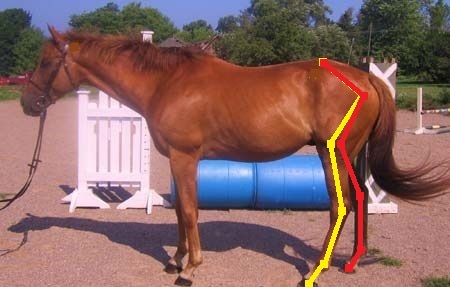 Here I attempted to mark the off leg to give you a better idea of what it looks like when the horse is standing properly. 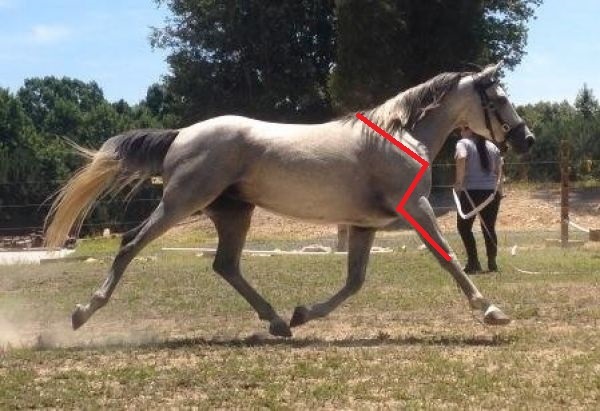 The hock set on this horse is okay, but unfortunately she possesses the highest stifle set of the group, due in significant part to the super long scapula and short forearm which puts her elbow low, but also because of her long tibia and short femur which raises the stifle. This mare also falls into the first gear category with a short femur and long tibia. She’ll have quick, short strides behind, but will lack the speed and power of the QH stallion. She’s not standing with the cannon bone perpendicular to the ground, so her angles are going to open a touch more. Below I’ve added a horse that is very specifically built for riding in almost every way. As it relates specifically to this article, though; third gearing, long femur, short tibia, low hock and stifle set, along with a big hip and superior loin coupling. By request here is a riding conformed individual with an over-angulated hind leg. This is a leg that is too long for the body. In this case THL represents 120.5%. You can see the closed angles of the stifle and hock. 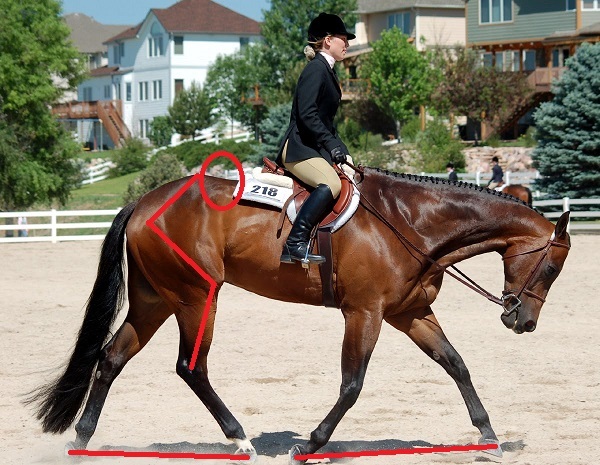 Over-angulated is less severe of a fault (provided it’s not excessive – this is as much as I’d ever want to see on a horse) than post-leggedness. Invariably the ability to engage is more difficult and these horses find it easier to trail their hocks than try and fit all that leg underneath themselves. These horses can forge, step on their front heels bulbs, or pull shoes more easily. Sometimes they’ll develop a hop to their gait as they try to hold the hind foot from landing a fraction longer so that the landed front foot can get out of the way. They can also step wide behind (place hind foot outside of the front foot). Hock twisting is prevalent and they can develop conditions such as curbs, as well the usual stress to the sacrum, loin and back from wanting to travel hollow. And so ends this conformation series. (Finally!) Now is the time to place our sample horses into order of worst to best *riding* conformation. This is a lot more difficult than it might first seem. To pick the best you will have to consider many aspects and grade them according to what can be outright ignored, what can easily be overcome, what’s going to be hard to overcome, and what’s impossible to overcome. I will post my ratings with explanation in the next week or so. I have no words, but lots of visual thoughts of what I’d like to do to this woman. Be sure to at least fast forward to the 4:30+ part of the video, you won’t believe what she does.